I love amplifying things like this because I know that every etisalat lovers with good reception in their locality will love this. I just stumble on this latest etisalat new offers and I bet it’s worth giving a trial. 1. Free 100MB every month without your money being deducted. 2. You’ll be able to use the free MB on any device you can think about. 3. 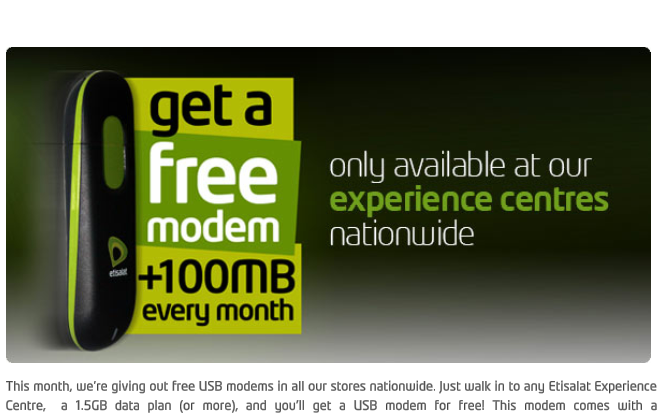 You’ll be entitle to free modem to be obtain in any of their experience centres. Just walk to any of their experience centres and purchase a data plan of 1.5GB +, and a modem plus free data will be handed over to you. Mind you, it is only available for new subscribers. I just bought and registered a new line, am I eligible for the offer. Please explain d steps u used Cuz it doesn't work for me during d day.is there any special thing done by u.